The altercation over the appointment of Shakuntala Gamlin as the Acting Chief Secretary of Delhi has taken shape of major hostility between the ruling AAP and Jung, with Kejriwal alleging that the LG was trying to take over the administration. Kejriwal had opposed Gamlin's appointment accusing her of lobbying for power distribution companies. He has declared that he would keep close tabs on the officer in the 10 days that she would act as Chief Secretary. Following the development, the AAP government had removed Principal Secretary (Services) Anindo Majumdar from the post for issuing the order of posting of Gamlin as the Interim Chief Secretary. Despite Kejriwal’s opposition, Gamlin was appointed to the post by Jung on Friday. The LG has maintained that the authority for transfer and posting of senior bureaucrats rests with him. The officer who was removed, Principal Secretary Anindo Majumdar, was locked out of his office yesterday, reportedly on the Chief Minister's orders. In a rapidly rising hullabaloo, the Delhi Chief Minister Arvind Kejriwal has issued a circular which says that for smooth functioning, "it is hereby ordered that any direction or order, whether oral or written, received from Honorable LG or his office to the Chief Secretary or any administrative Secretary, shall first be submitted by the concerned administrative Secretary/Chief Secretary on the file to the Minister in charge and the Chief Minister for a decision." This circular came after the LG wrote to the Delhi Government saying its decision to remove an officer and appoint another were "void" as he had not cleared it. The LG has met the President and has reportedly discussed his disagreement with the Delhi Government, with respect to his decision to appoint IAS Officer Shakuntala Gamlin as Acting Chief Secretary. After meeting the President, LG Jung also met Union home minister Rajnath Singh and informed him about the stand-off on appointment of senior bureaucrats. The former ASG further explained the appointment procedure and said, "The proposal to appoint the chief secretary must be initiated by the government in accordance with the rules of business…. The question of any difference of opinion on that issue can arise only after the proposal is made by the council of ministers and sent to the LG. Prior to that no question of difference of opinion can arise." Emphasizing on the premise that the AG has not independent discretion in the matter of appointment of the Chief Secretary in the democratic scheme of the Constitution of India, she said, "The decision who to appoints the chief secretary must be of the council of ministers and it is only when the LG has a difference of opinion on that decision that his role begins, hence there is no question of the LG taking the decision who to appoint as chief secretary without waiting for the decision of the council of ministers." Read the full text of the Indira Jaising's opinion here. Finance Minister Arun Jaitley called Delhi's "experiment" with AAP a "costly" one and said, "AAP has such a huge mandate, they must understand their responsibility and that people want governance, not controversies and disputes. But if they can't, then it is also our responsibility to make them understand." Supreme Court lawyer Rajeev Dhavan has also supported Mr. Kejriwal and said that the Chief Minister has a "perfect right" to a chief secretary of his choice and the current "crisis" has been created by the LG. "The chief minister has a perfect right to a chief secretary of his choice. I am firmly of the opinion that this crisis has been created entirely by the LG," Dhavan wrote in his opinion to Delhi government. Dhavan added that "lapse of 40 hours is not sufficient reason for the LG to impose his choice on the CM especially when his urgency powers arise only when a reference is pending before the central government". He said that at best, the LG can bring it to the Chief Minister’s notice that it has become necessary to appoint a Chief Secretary forthwith. It is absolutely clear that the LG has exceeded his authority and has turned the entire relationship between himself and council of ministers on its head to jeopardize democracy and the Constitution, he said. Raising questions over the LG’s behavior, Mr. Dhavan raises certain questions: Was he acting for himself? Or, which is one’s worst fear, is he acting for someone else or on behalf of someone else? Does he want to hold on to this office? Or does he want some other more prestigious office? These suspicions cannot be allayed easily. Both Kejriwal and Jung have gone to the President. What can the President do? He considers it Modi’s responsibility to tell the LG to stay within the Lakshman Rekha of his power. Responding to the legal opinion sought from him by the Government of the National Capital Territory of Delhi in the backdrop of the turf war between itself and the Delhi Lieutenant Governor Najeeb Jung, senior lawyer and former solicitor general Gopal Subramaniam has furnished his advice to the Delhi Government to the effect that exercise of powers by the government of Delhi cannot be overruled by the Lieutenant Governor as this would violate the Constitutional Scheme. “It is constitutionally unviable for LG to act de hors the aid and advice of council of ministers,” Subramaniam wrote in his legal opinion sent to the Delhi government. “Given this position of law, it would be constitutionally unviable for the Lieutenant Governor to act de hors the aid and advice of the Council of Ministers on any such matter. Any such action would be clearly contrary to the provisions of Articles 14 and 239AA, as well as being ultra vires the provisions of the Government of National Territory Capital Territory Act, 1991 and the transaction of the Business of the Government Rules, 1993,” he added. 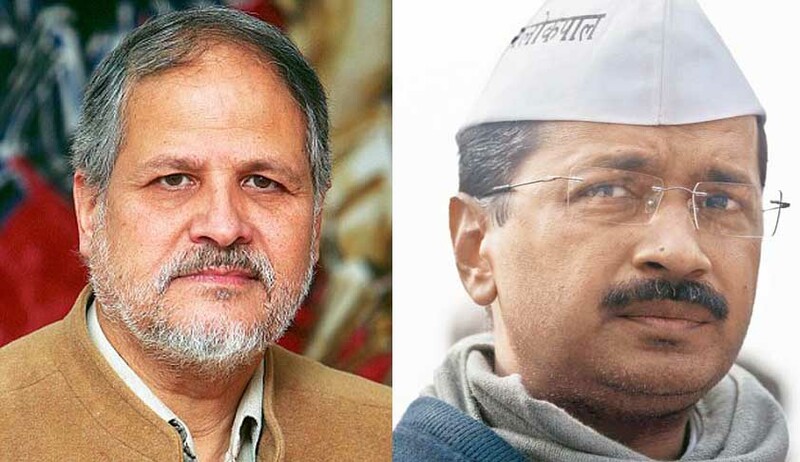 The row between the Lieutenant Governor and the Chief Minister began after Jung appointed senior bureaucrat Shakuntala Gamlin as the acting Chief Secretary despite strong opposition from Kejriwal. The Kejriwal government had levelled serious allegations against Gamlin accusing her of being extremely close to power distribution companies in Delhi. Kejriwal also sent her a letter asking her not to take up the post as, according to him, her appointment was against the rules. Both Jung and Kejriwal took the matter to President Pranab Mukherjee yesterday. Delhi Deputy Chief Minister Manish Sisodia has, meanwhile, called a meeting of all the Secretaries and Chief Secretaries today. The AAP government had also sought the opinion of eminent lawyers Rajeev Dhavan and Indira Jaising on the issue and they have also supported its stand.